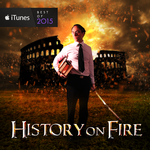 Where history and epic collide--"History on Fire" is a podcast by author and university professor Daniele Bolelli. On July 11, 1804, the vice-president of the United States (Aaron Burr) and the first Secretary of the Treasury (Alexander Hamilton) decided to settle their grievances by drawing their pistols and trying to shoot each other dead. This is the story of the events leading Burr and Hamilton to stop exchanging words and begin exchanging lead.